I miss Yorkshire puddings! Will definitely try the recipe. I’m going to give these a try today using aquafaba (canned chickpea brine) instead of the egg replacer! Wish me luck! 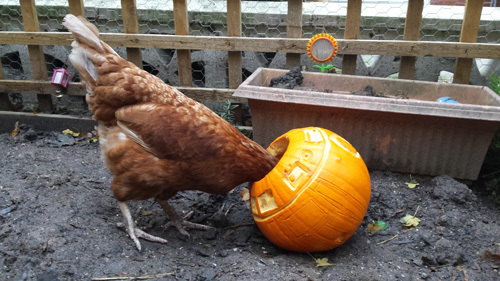 What do you do with the chickens egg’s then, why wouldn’t you use them in your Yorkshire Puddings? In regards to my rescue hens, it is noticeable how protective they are of their eggs – I wouldn’t want to stress them by constantly removing them. Imagine if your landlord kept taking your possessions without asking! 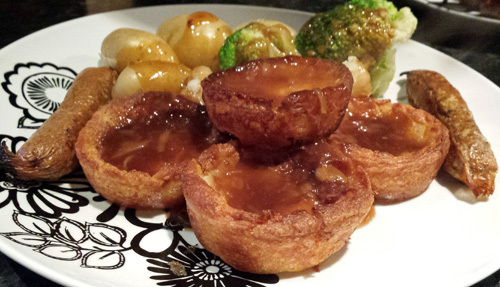 I made these last night and they were the best vegan Yorkshire puddings I’ve had! I also made a gluten free batch for my sister and they were great, she said they were the best Yorkshire puddings she’s had too (and she’s not vegan). 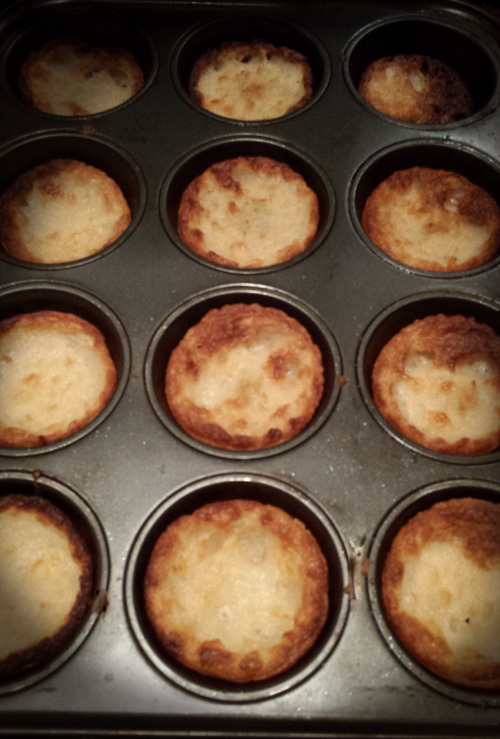 I did have trouble with them sticking, but I’d say that’s just my pan/oven. I though 30 minutes to bake was a long time but they really do need it. Great recipe, thank you so much for sharing! I had a panic because I couldn’t get them to work again… turned out I was using a different tin – one that was too shallow! Went back to my old tin and they worked fine again, phew! Yorkie puds are very fickle things! 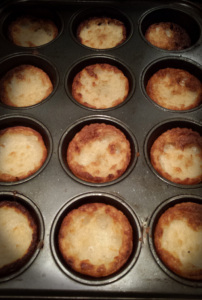 Made these for Christmas Dinner – fabulous – thanks for the recipe! Recipe I tried last year turned out like biscuits. These were crispy on the outside and slightly doughy on the inside – just how I like them. 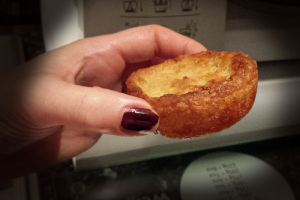 I used a deep yorkshire pudding tin and it made 12 good sized yorkshires. I made this beauties yesterday to go with my Sunday roast and they were perfect. Light, fluffy and crisp. I am ashamed to say that I ate 5 of them! Had to freeze the rest asap, so I did eat the whole tray of them! Yeah, so glad they worked for you ^_^ Thanks for sharing! Haha, so glad both you and a non-vegan approved ^_^ Toad in the hole rocks, I had it last week, yum yum! So this recipe works for toad in the hole too, only with a roasting pan? Have you tried Sainsburys pork style sausages? MMMMM delish, knocks linda mcartneys out of the park. (sorry linda,respect). Just tried these at the weekend and they were amazing. Thank you for the great recipe. I have managed to get the taste previously but not the rise. I will try with aquafaba next time and see how I get on. Will let you know. 5. What size was your pudding tin? This recipe works better with the smaller wells. One way to prevent a soggy bottom is to lower the heat once the tops look cooked, and just leave them in for another 5 mins or for as long as you can before burning. Hi! We had two previous unedible vegan Yorkshire results up until using your recipe, which had them looking glorious when they came out the oven! The outsides were brown and crispy (even the base) and they felt light. However on biting into them they were still pretty wet on the inside (I don’t mind doughy but this is different). They had the full 30 mins and they went into bubbling hot oil. If I’d left them in longer would they have eventually cooked through? Thanks, you have given me hope I don’t have to go without my favourite bit of a roast dinner! Sorry to hear about your wet insides! I am a bit old and technically not brilliant….. I have been trying to find your roast ‘pork’ and stuffing joint creation, and not having much luck…..could you help me please?